Laszlo! LAAAAsssszlo! We got a Liebster Blog Award!!!! Holy $%&*#!*! A couple mornings ago, after crying herself to sleep because she couldn’t write a novel in three months and also because she felt fat and it was all Laszlo’s fault because he kept chocolate in his house and also ordered dessert a lot, Lala awoke to discover her micro co-blog with Laszlo had been given a Liebster Blog Award by her total future soulmate over at Softer City — an awesome blog that continuously helps Lala feel like she can someday fit in in the big Apple. Through her gummy eyes she read the kind words of its author, girlnextfloor. And then she rejoiced. She woke Laszlo by going to his house and ringing his doorbell sixty times. He rejoiced but seemed tired. Happiness is realizing that you are noticed, then humiliating yourself until everyone starts to look away again. Then she had to go to her new dentist who was awesome and who told her she was flossing okay but might she floss some more in the future? Please? Also, less chocolate might help. The whole time she was happy. Imagine, she thought, Someone is reading! Or skimming! Or something! When she got home Laszlo gave her chocolate. This was a bump in the road. 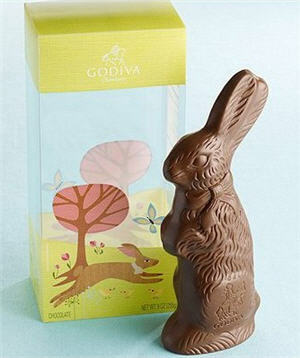 Even this bunny, who died in the name of chocolate cravings everywhere, could not put off our happiness. Still, she was happy. So, kind readers, skimmers or simply drive-byers of Naked And Hopeful, please hustle and bustle on over to check out girlnextfloor’s great stuff, because she stopped Lala from crying even more over her failure as a human, a woman, and a writer. Thank you thank you thank you thank you thank you, Softer City!!! 3. Toulouse in a Pickle – just a great narrative blog with a really cool voice. Very atmospheric. 5. Softer City – because I was a fan of this awesome blogger before she was a fan of us… Her New York-centric blog rocks. This entry was posted in art, artist, Humor, Laszlo Von Glitz, Liebster Award, life, love, Manhattan, New York, New York stories, novel, writer, writing and tagged Blog, Blog award, Easter, Google Translate, Hamptons Art Hub, Lala, Laszlo Von Glitz, Liebster Blog Award, Nae's Nest, New York, Other THings, Ralphie, Tools by Wednesday Black. Bookmark the permalink. How’s life you know where?